ArcGIS for AutoCAD is a free, plug-in application for AutoCAD that allows you to access and create GIS data by connecting to services from ArcGIS for Server and ArcGIS Online. Within the AutoCAD environment, you gain easy access to enterprise GIS maps, map services, image services, and feature services. In addition, ArcGIS for AutoCAD allows you to edit ArcGIS data that has been stored locally within the AutoCAD drawing or exported from ArcGIS for Desktop. Streamline information sharing between GIS and CAD groups. View live, rich cartographic GIS maps in AutoCAD. 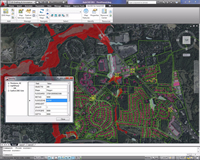 Include the results of GIS analysis in AutoCAD designs. Add imagery to your AutoCAD drawing. Create, manipulate, and define how CAD data is organized and attributed as GIS content so it can be used in ArcGIS for Desktop or AutoCAD.